I can’t even keep track of my 16 nieces and nephews’ kids- what would I do if I had 40 grandchildren and 52, and counting, GREAT- grand children whose names I wanted to remember. 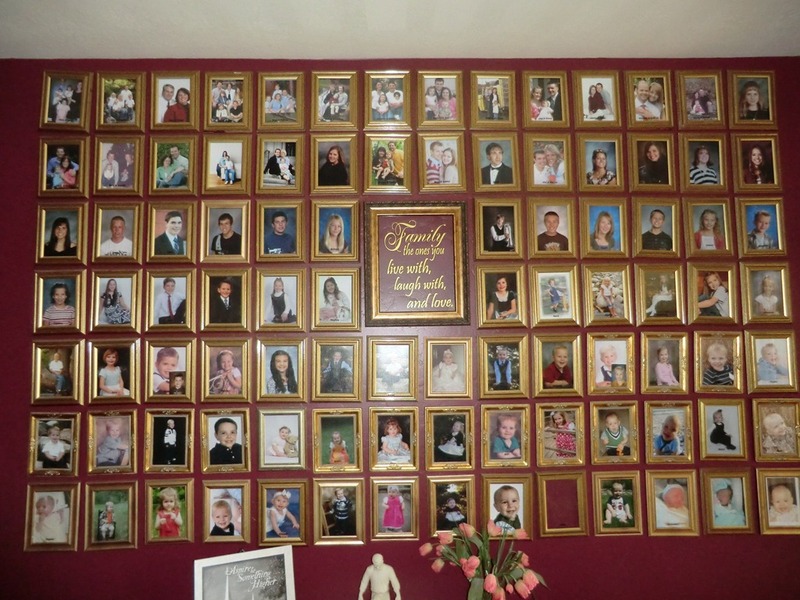 Well, I guess I’d do what Elgie and Ruth Hale have done- a family photo wall. Most grandparents would like to keep in close contact with the grandchildren, remember birthdays and other holidays and attending special events in their grandchild’s life. When grandparents turn into GREAT- grandparents, the challenge of knowing the great-grands becomes a bit more challenging. 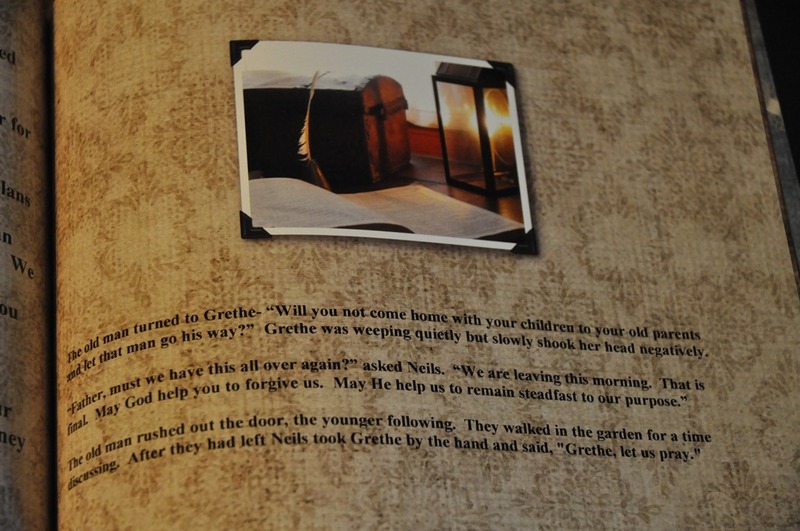 The Hale’s met this challenge by dedicating one wall in their home to their grandchildren and great-grands whose photos are displayed in 4×6 frames on their special family wall. They are listed from oldest to youngest with each name displayed at the bottom of the frame. Family members know what size of picture fits in the frames and can send updated school pictures or candid shots to be placed in their own special frame. Of course, if you don’t want to devote a whole wall to your family photos you could keep them in a three ring binder or smaller photo “brag” book and refer back to it before family gatherings and special occasions. A book such as this would be a wonderful gift for Great Grandma and a fun project for a grand daughter. 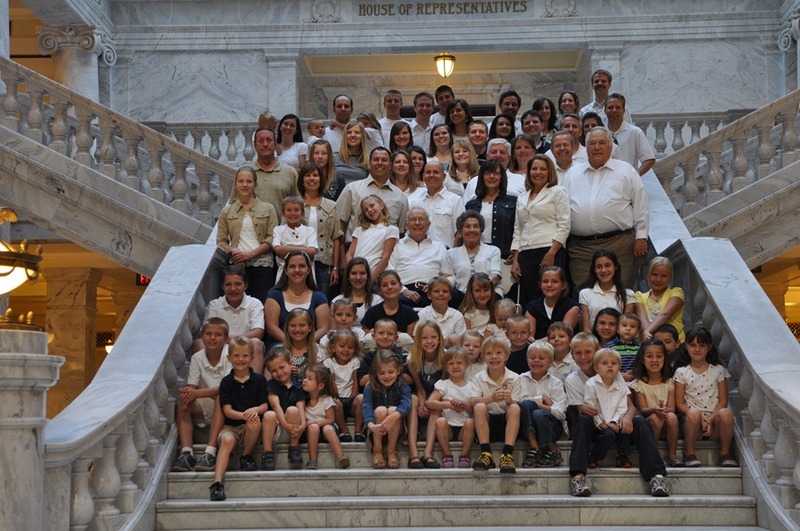 Next time your family gets together for a family reunion or party take a family photo. Take your cue from school class photos and label the photo with family member’s names for easy reference. However you choose to do it- helping Great-Grandma and Grandpa stay in touch with their great grandchildren can help connect the child to their roots and enhances the grandparents’ legacy. The only thing I would change about the Hales family photo wall would be to add the following quote- because at the Hale home this really is what LOVE looks like. I’m so lucky because I had some ancestors that wrote things down and family members, like my Mom and my brother, Scott who made sure old photos were labeled, digitalized and stored safely. My contribution to their efforts is to share some of my ancestors life stories in digital photo books. 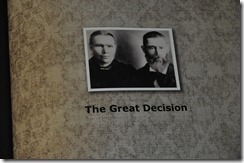 Besides making a reunion scrapbook each year, I have also made family history or genealogy books. This is fun to do if you have a lot of stories about an ancestor. The book pictured below is about an ancestor and the decision they made to come to America. I didn’t try to tell their whole life story just the events that led up to their coming to America and their arrival here. As you might expect, part of the challenge when making this type of photo book is getting enough pictures to go in the book. I handled that problem by finding generic pictures on the internet and using them in my books. 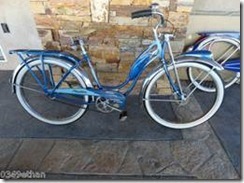 For instance, if Grandma got a 1950’s blue Schwinn bike for her 8th birthday search for that image on the internet and add it to your book. 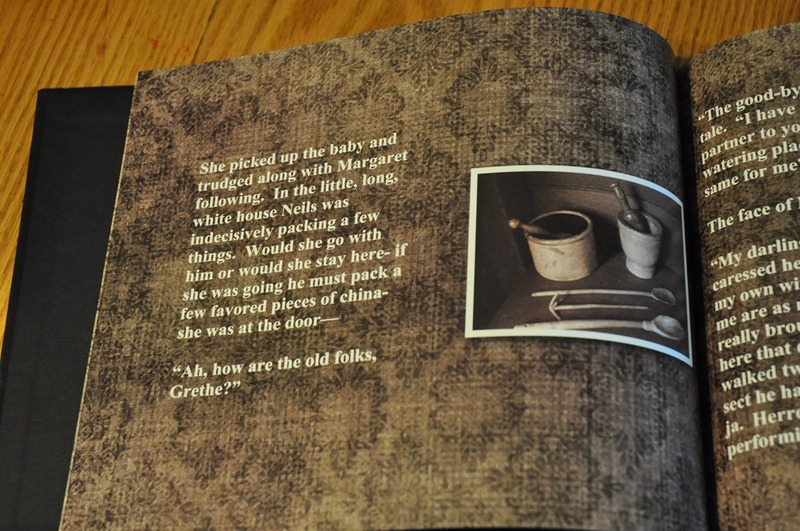 (Note: be sure images are not copywrited) In the picture below you see a page that is telling about a conversation our ancestors had in their kitchen. Of course I didn’t have a picture of their kitchen but I did find a picture of cooking utensils they might have had in their kitchen and included that in my photo book. I repeated the same idea with this page. Although not personable to my ancestor it is representative of life when the story took place. 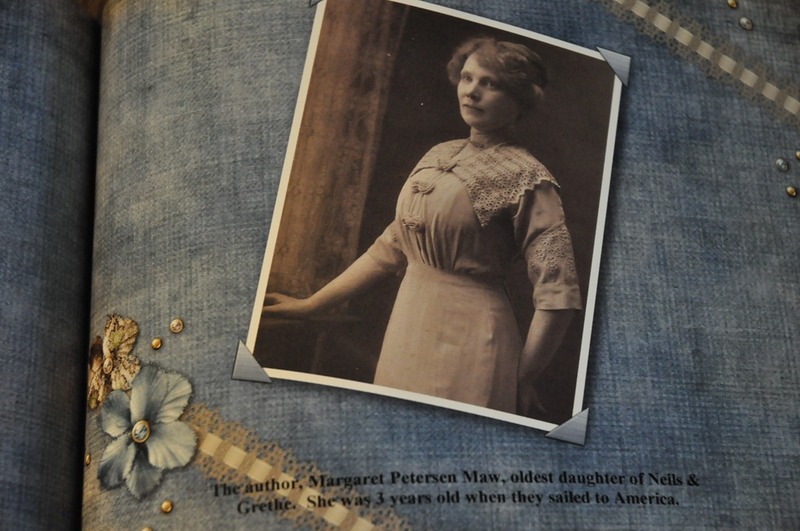 The best pages are those that feature actual photos of ancestors to illustrate real stories from their life’s. 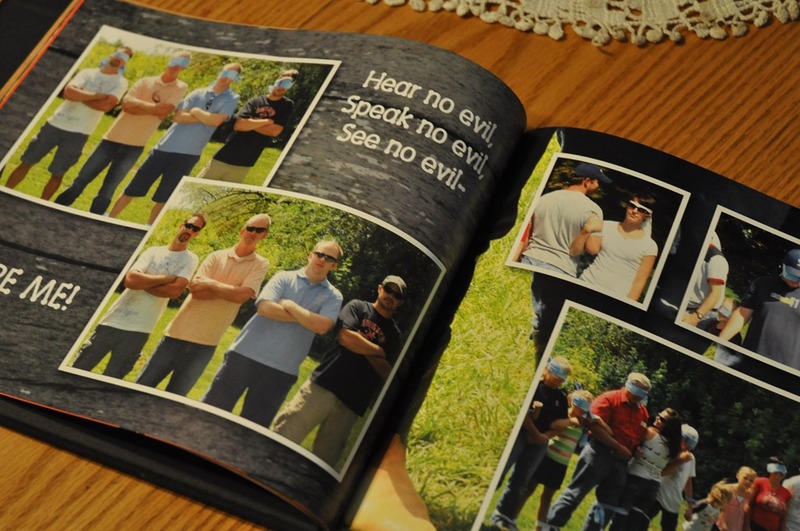 The easiest photo books to create are those of loved ones that are still living. When my Mom celebrated her latest milestone birthday we gave her a book of lessons learned and fun experiences we had growing up with her. We titled it “Teachings, Tall Tales and Inspirations” and Mom loves it. You can buy copies of your book to give as gifts to family members, auction them off to raise money for your reunion or just let family members know the book is there and let everyone buy their own copy. Emory University concluded in a recent study of children ages 14-16 that “a child’s ability to retell family stories was linked to lower instances of depression, anxiety and less acting out due to frustration and anger”. There is an African saying that "a people without knowledge of their history is like a tree without roots. 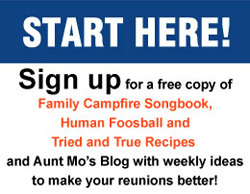 "Kind of reminds me of my favorite reunion quote, “A tree without roots falls over.” The moral to this story- share the stories of your ancestors whether it be around the campfire or in a genealogy themed photo book.